Paris 25thSeptember, 2018. 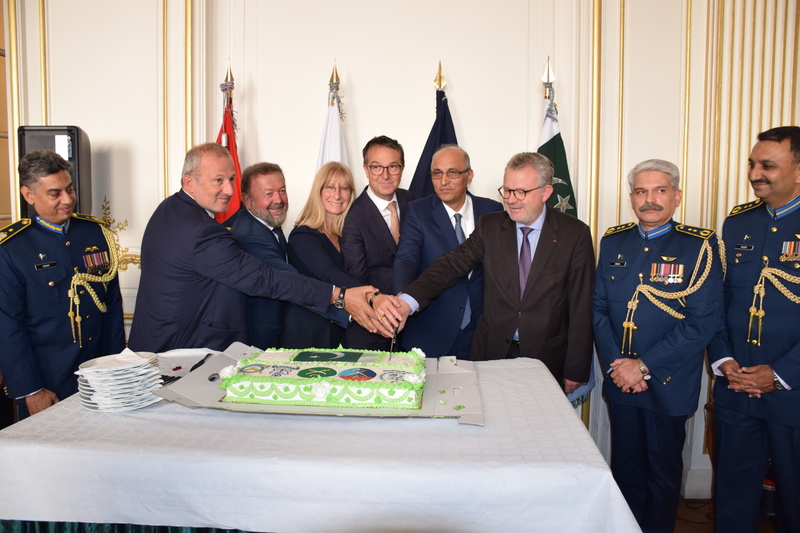 The 53rdDefence Day of Pakistan was observed with traditional zeal and passion in a simple but dignified ceremony held at the Embassy of Pakistan in Paris today to pay tribute to the people and Armed Forces of Pakistan and all those who laid down their lives while defending the country. The ceremony was attended by a large number of officials from French government, parliamentarians, Ambassadors and Defence Attaches of friendly countries, representatives of media and think tanks. The Ambassador of Pakistan Mr. Moin ul Haque during his address highlighted the significance of the day and countless sacrifices of the people and Armed Forces of Pakistan for protecting the motherland. Ambassador said that Pakistan foreign and defence policies are based on the principles espoused by Quaid-d-Azam, “peace with all and enmity with none”.As a responsible nation and a member of United Nations, we desire peaceful and friendly relations with all our neighbors and believe in dialogue and constructive engagement for regional and global peace. Senator Pascal Allizard and Mr. Jean-Bernard Sempastous, Presidents of Pak-France Friendship Groups in the French Senate and National Assembly respectively were the Guests of Honour who laid the ceremonial floral wreath and cut the cake on the occasion along with the Ambassador Moin ul Haque and Defence & Air Attaché, Air Commodore Syed Muhammad Azmat Ali. Guests of Honour Senator Pascal Allizard and Mr. Jean-Bernard Sempastous, Presidents of Pak-France Friendship Groups in the French Senate and National Assembly were cutting the cake along with the Ambassador Moin ul Haque and Defence & Air Attaché, Air Commodore Syed Muhammad Azmat Ali on occasion of 53rdDefence day of Pakistan in Paris on 25-09-2019. Mr. Moin ul Haque, Ambassador of Pakistan to France is addressing ceremony held to marked 53rdDefence Day of Pakistan in Embassy of Pakistan Paris today on 25-09-2018. Paris 19th September, 2018. 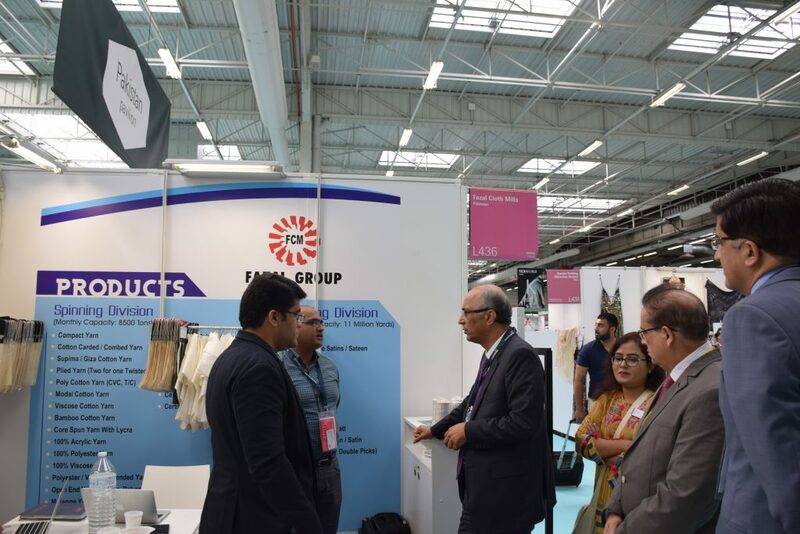 Twelve Pakistani textile companies participated at Texworld, the bi-annual International textile exhibition held in Paris from 17th to 20thSeptember, 2018. 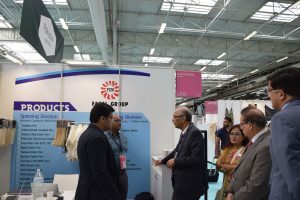 The Ambassador of Pakistan to France Moin ul Haque visited the Pakistan Pavilion established at the exhibition and met various companies and thanked them for their participation showcasing a wide range of their quality textile and leather products. The Ambassador noted with satisfaction that the Pakistan’s exports to France are following an upward trajectory since the launch of economic diplomacy initiated by the Embassy in 2016. In the year 2017, total bilateral trade increased to US$1.58 billion compared to US$1.467 billion in 2016. He added that the data for first months 2018 reflected 8% increase in the bilateral trade, which was a welcoming trend. Some of the major Pakistani textile groups/exporters namely Nishat Mills, Kohinoor, Sapphire, Kamal Limited, Siddique Sons and Master Textile had also established their theme based customized pavilions which attracted large number of potential buyers. The Texworld held twice every year is a popular trade fair exclusively for professionals from the textile and fashion industry. It is a valuable and efficient gateway to the European market for international textile manufactures. Each year, a number of Pakistani textile companies participate in the exhibition with support of Trade Development Authority of Pakistan (TDAP). 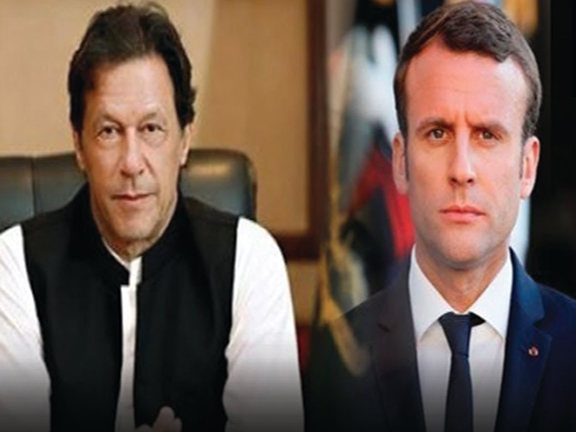 President Emmanuel Macron of France telephoned Prime Minister Imran Khan this evening to congratulate him on his party’s election victory and for assuming the office of Prime Minister. Paris 7th September, 2018. The Ambassador of Pakistan to France Mr. Moin ul Haque paid rich homage to martyrs and veterans of Armed Forces of Pakistan for their sacrifices in the defence of the country. He said this while addressing an event organized by the Pakistani Community of France to observe the Defence Day of Pakistan on the theme “We love Pakistan” in Paris yesterday. The ceremony was attended by the officers of the Embassy, notables of Pakistani community and media persons in large number. In his address, the Ambassador said that our Armed Forces have always shown extraordinary courage and professionalism while defending our homeland against a much bigger enemy. Their role and sacrifices in defeating the forces of terrorism from our soil is also exemplary and unprecedented. He added that the international community has recognized and acknowledged the enormous sacrifices rendered by the people of Pakistan to defeat terrorism and extremism. The Ambassador said that Pakistan has always desired peace and development in the country and the region. It will continue to make sincere efforts for developing friendly and mutual beneficial relations with its neighbours. He also called for just and lasting solution of the Kashmir dispute for durable peace in south Asia. He requested the Pakistan community to play its due role in promoting Pakistan and its interests in France. The notables of the Pakistan community in their speeches paid rich tribute to the martyred and Ghazis of the 1965 war and their families and assured that like in the past, Pakistani diaspora in France will continue to play its due role for progress and prosperity and defence of the country. Messages of the President and Prime Minister of Pakistan issued on the occasion were also read, while community members also performed some patriotic songs during the event.